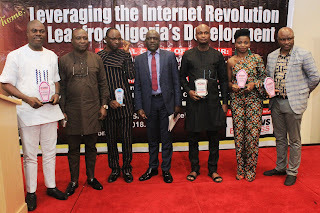 It was a of fun, glamour and intellectual feast as the maiden edition of the Nigerian Online Merit Award (NiOMA) held Friday night, July 13, at the Function Suite of Lagos Sheraton Hotel, Ikeja, reports ITRealms. About a dozen outstanding players in Nigeria’s online space were honoured at the event spiced up with comedy and musical performances. They include Governor Akinwunmi Ambode of Lagos State, who emerged the e-Governor of the Year, and Africa’s Serial Digital Entrepreneur, Leo Stan Ekeh, who was honoured as ICT Icon of the Year. Other winners included Akwa Ibom State (Best State Website) and Nigerian Communications Commission (NCC), which won the MDA of the Year award. Three winners emerged in the banking category, namely, Zenith (Platinum), Fidelity (Gold) and Access (Silver). Similarly, there were three winners in the newspaper category – Vanguard (Platinum), The Guardian (Silver) and Daily Trust (Silver). A brainchild of Nigeria’s leading daily online newspaper, News Express Nigeria, NiOMA is designed to celebrate outstanding individuals and corporates driving the Nigerian online revolution. Pix: Some of the winners of the 2018 NiOMA . . . Friday night at Lagos Sheraton Hotel, Ikeja.